so – i was thinking a few weeks ago that I hadn’t been able to get hold of any Juliet Berto films other than Celine and Julie. So I’ve been searching pretty regularly on ebay recently and I finally found a DVD copy of Duelle. 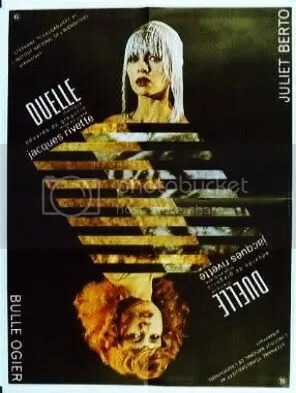 Duelle was released in 1976, and is in a way the logical film to follow up Celine and Julie – it was t Jacques Rivette’s next film, and as well as Berto.it stars Bulle Ogier (Camille from Celine and Julie). It received a very limited release outside France. I received the DVD on Christmas Eve (so a welcome extra Christmas present). The film is in French, not a language I speak with any fluency, and was not subtitled. Of course I knew that when I bought it – but what the hell – I thought I could watch it – guess the plot and enjoy the photography. Anyway – a bit of research after Christmas – google as ever is my best friend – and I found an amazing website that allows people to share, upload and download film subtitles – and on there – someone has very helpfully put English subtitles for Duelle. So subtitles downloaded – what to do with them. Google again – and apparently there is a free plug in for windows media player that lets you add a subtitle file to a video. That downloaded – but couldn’t make it work – despite loads of people on various forums saying it was foolproof and simple. Well it fooled me. Another hour of search and download and failure before I found VLC media player. A freeward product that can play DVD movies and merge in separate subtitle files. Success at last. Watched the first few minutes of the film to find that the subtitles were out of sync with the sound track by about five seconds, the text came up before the speech so you had to predict who might be saying what. Google again – and more freeware – subtitle workshop – which allows you to edit and re-sync the titles. Finally, after about four hours I got to watch Duelle – in French – with English subtitles. I was just so impressed by my techie wizardry!. The verdict on the film – a wonderful lost masterpiece of course. Duelle is not listed in virtually any major film book, from film guides to the mighty tomes of the critical elite, it’s disappeared like one of its ethereal protagonists. Maybe Rivette is his own Keyser Soze, and the greatest trick he ever pulled was making you think Duelle didn’t exist. One hesitates to say too much about the plot of Duelle – it can be fatal you know – and I’ll limit myself to saying it’s about the search for the magical Fairy Godmother crystal by two vengeful Gods who want to wreak havoc on the earth all the year round rather than be phantoms a mere 40 days a year. Gods and humans alike seek the stone, and many die, Malory-like, in the attempt. There are essences of numerous films before and since, and though the majority are from Rivette’s own oeuvre, those who have seen Harry Kumel’s Malpertuis will have the advantage of everyone else. Fans of Antonioni will also find much to appreciate, not least in a final showdown on a grassy park not dissimilar to one immortalised in Blow-Up. The Fairy Godmother stone is both a MacGuffin to end them all and the very meaning of existence itself. Or else it is nothing, for that’s what Duelle is about really; everything and nothing. About the reduction of everything to a state where two plus two is no longer four and all the walls of time and space collapse. The two rival goddesses are Queen Mabs of the mind, trying to extend their existence from one reality to another, and it’s appropriate that they are played – and played is the right word, for all the world’s a magical playground for Rivette – by two of his mainstays, Bulle Ogier and Juliet Berto. Ogier in particular is hard to forget, a Mab in androgynous modern dress, slinking around like a malnourished baroque vampire. It’s impossible to describe for those not in the know, but its effect is symbolised in the new moon, like a cinematic Stonehenge aligned directly to be lit by the rising moon not on a Salstice, but on the first full moon in spring. Even now, writing after seeing it again, one expects to wake up still; there is no Duelle. It doesn’t exist, a dream described like those in the film, aquariums in the night.